London’s airport chaos may have been exacerbated by Microsoft Windows XP still being used across various critical systems with one of the world’s largest airlines choosing to process boarding passes on the OS. 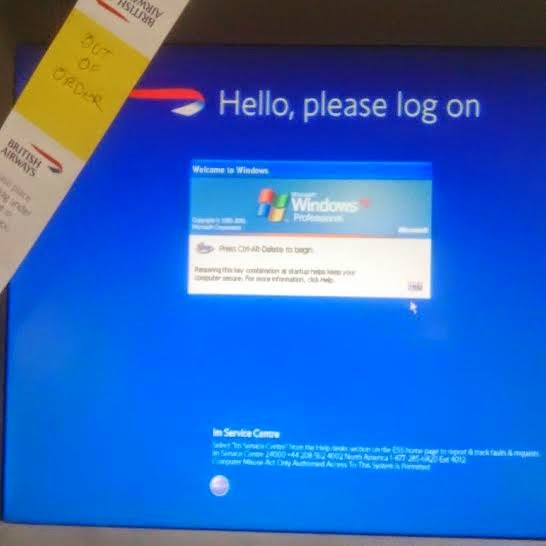 British Airways, which has been badly hit by the shutting of London’s airspace earlier today, still uses the out of date OS to print off customer boarding passes with the photos above showing the Ctrl+Alt+Del command still very much present in Heathrow Terminal 5. Microsoft told businesses for months in the lead up to 8 April 2014 that support was ending and despite that being the case, around 44 per cent of all Windows desktop machines are powered by XP. The UK government secured a costly £5.5 million extension of support for Windows XP and it seems like British Airways has done the same, otherwise it is leaving itself vulnerable to all manner of different threats. Small and medium sized businesses [SMBs] have been one group that has been quick to say goodbye to Windows XP, yet there were still 18 per cent conducting everyday business using the OS in July, according to Bit Defender. Many are still worried about the alternatives and are holding out for Windows 10, something that is incredibly risky when it comes to security. The Nation Air Traffic Service [Nats] centre, which opened in 2002, has yet to come out with an explanation as to why the “technical problem” has occurred and it comes after a telephone glitch affected the same Hampshire based control room last year. Rumours are currently pointing to the problem being software based and whilst it’s too early to speculate that Windows XP is used by the Nats, the fact that BA is still using the outdated OS is enough of a worry in itself. Our advice to SMBs still using it: Get it out before it’s too late.